Also known as "Le village des idiots"
"Weary of daily life in his native village of Chelm, Shmendrik sets out on a quest for knowledge that brings him to a new Chelm, a place remarkably like the old Chelm, down to the chicken's reminiscent clucks. 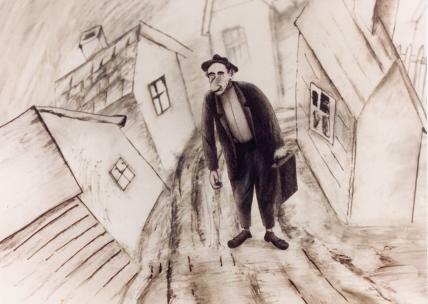 Based on a Jewish folk tale, adapted by John Lazarus, Village of Idiots is the story of Shmendrik's new life and its uncanny closeness to his old life; offering an extremely funny take on our tendency to romanticize what we don't have. The animators filmed paper cut-outs on layers of glass to achieve the rich, textured visuals." National Film Board of Canada. "NFB -- Village of Idiots." National Film Board of Canada. http://onf-nfb.gc.ca/en/our-collection/?idfilm=33250.